A grab bag category of nice old postcards! Check them out! 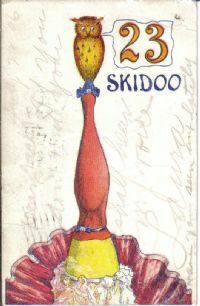 #647 Unusual 23 Skidoo Ladies Leg !!! #689 Unusual Man In Moon Smoking Pipe? #354 Unusual Taxi Driver Postcard 1940's? 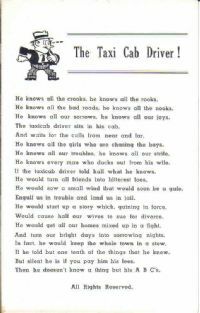 Here's a super 1940's era postcard sized card that has a cute poem about Taxi Cab Drivers! Although it has a non-postcard back, it is exactly postcard sized. It is printed with an image of a funny little man and has an unusual story/poem about the small town taxi driver. A neat old taxi related item! Back of card is blank. Condition is near mint to mint! Any lines or waves are from the scanner and not on the actual image. Here is an unusual old postcard! I'm sure it is some type of polical statement for the time. It pictures the North Pole of the earth, with Uncle Sam standing at the top. He looks off into the sky, where stars and clouds form an American Flag. It reads "You Can't Lose Me", possibly referencing the loss of the North Pole to another world power? A unique card! Back is copyrighted 1909 North Pole Series and is postmarked "Colorado 1910". Condition is faie with corner crease/wear as shown.